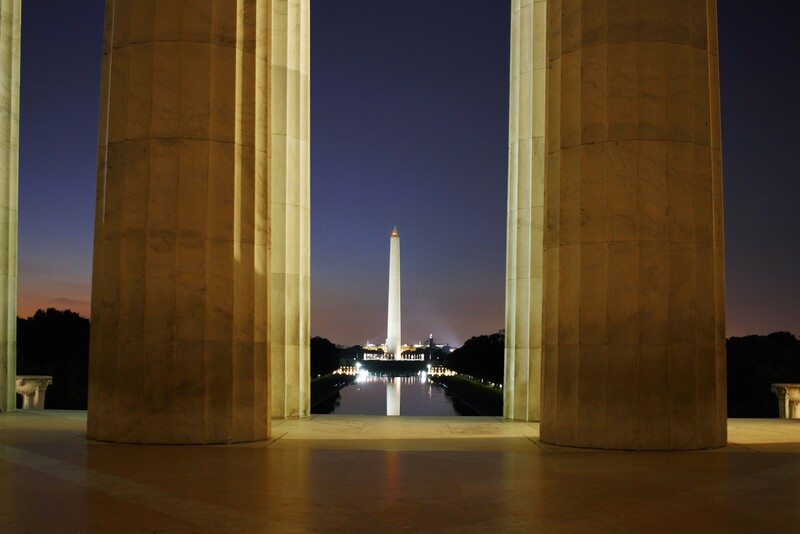 When thinking of the memorials and monuments of Washington, D.C., “classic Greek temple” may not be what immediately comes to mind. 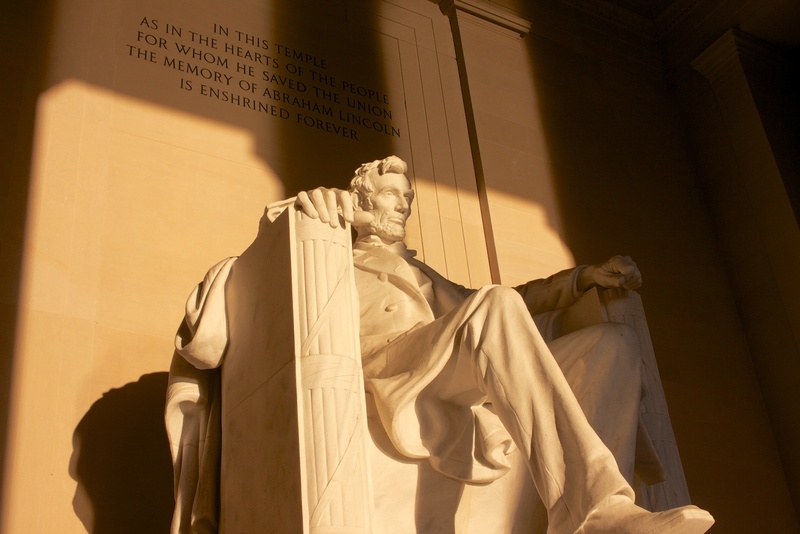 Maybe that’s exactly what comes to mind, however, as the Lincoln Memorial and its towering Doric columns is so ingrained in culture that it hardly seems out of place. 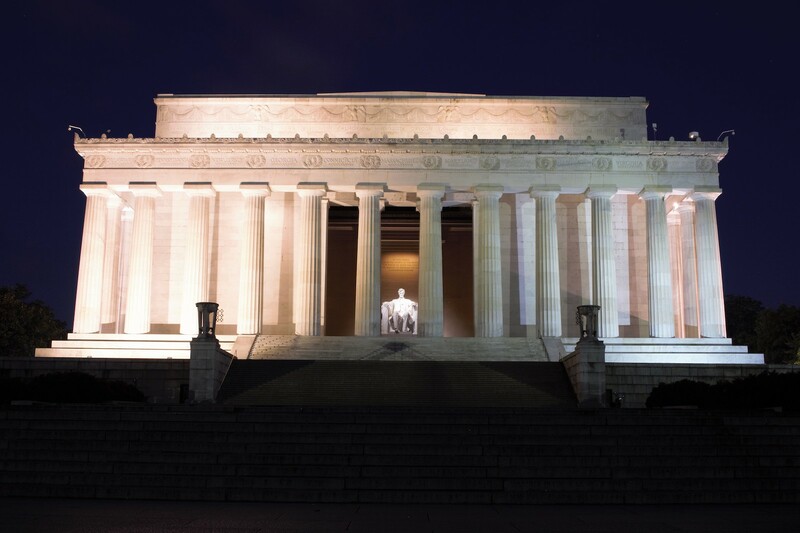 Anchoring the west end of the National Mall, the Lincoln Memorial rises splendidly out of Potomac Park, enticing over 5 million visitors per year toward it. 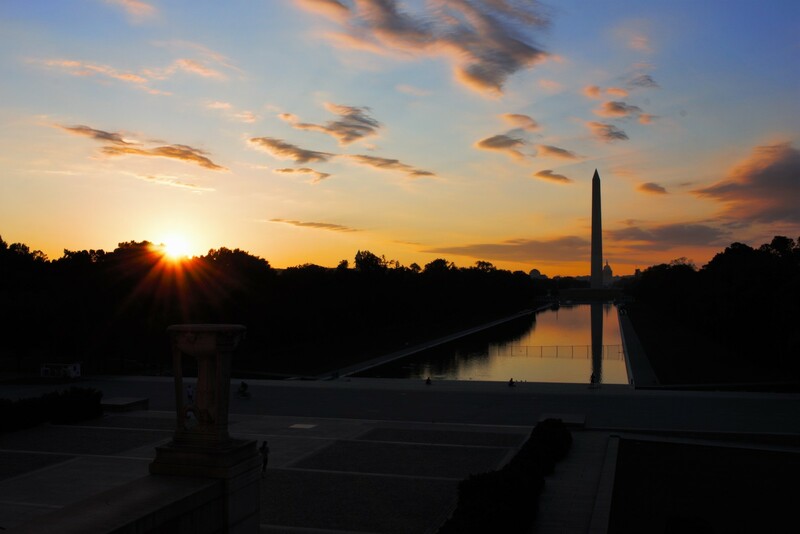 And moving toward it is a brilliant decision, because it is one of the most beautiful, powerful, and wonderful monuments built in the United States. 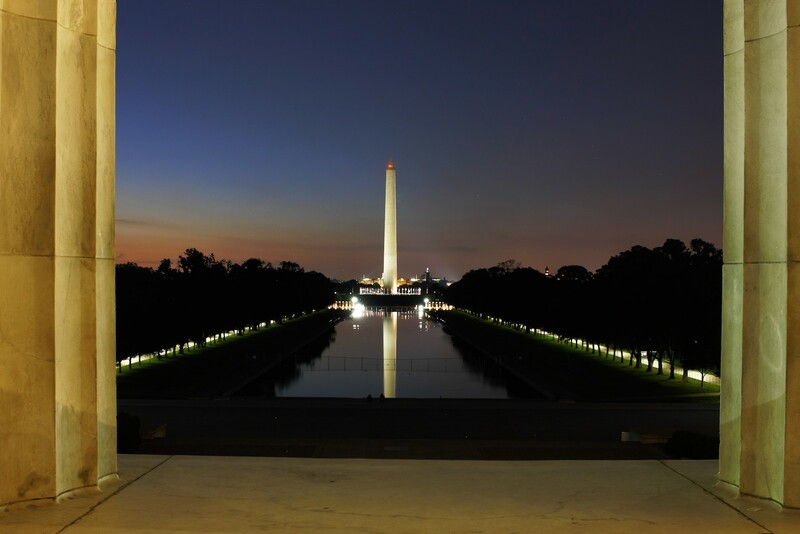 At 99 feet tall, 190 feet wide, and 119 feet deep, the structure is unmissable from the Mall, with the approach further sweetened by the shallow reflecting pool that stretches over 2,000 feet before the memorial. 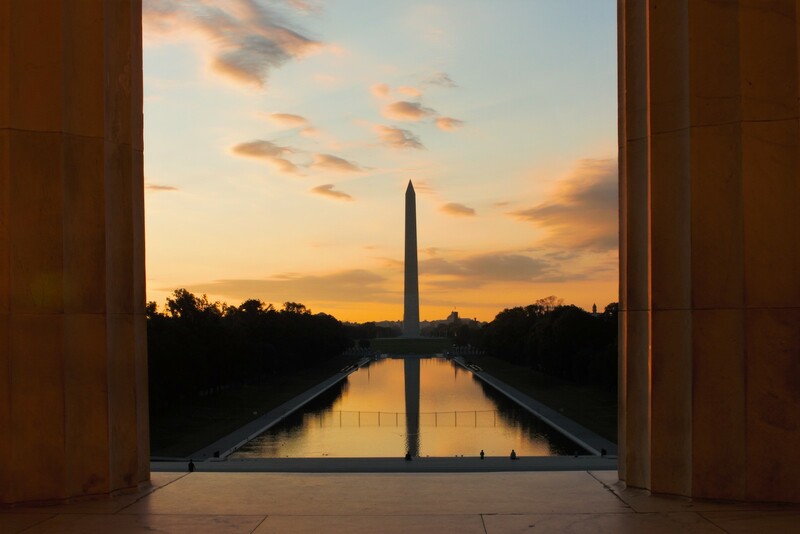 When standing in front of the Lincoln Memorial, the pool delightfully reflects the Washington Monument looming nearby. 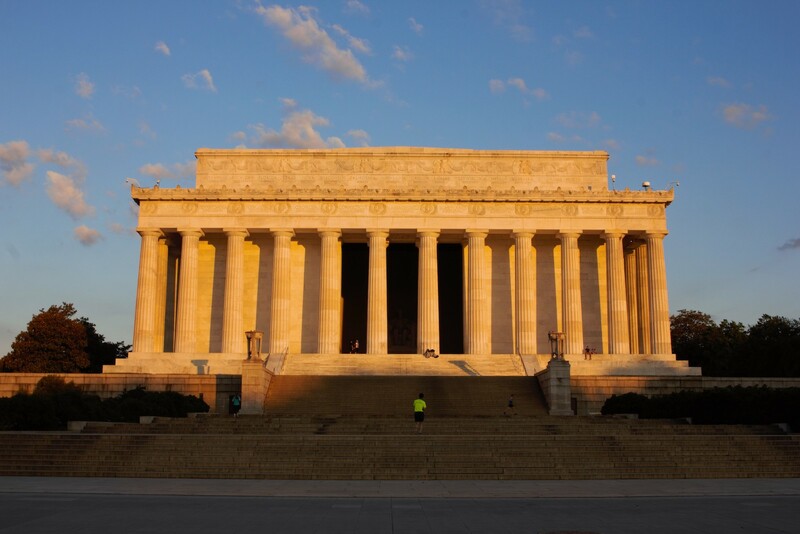 Walking toward the Lincoln Memorial, the first noticeable feature is the 36 fluted Doric columns that surround the exterior, representing the number of states in the Union at the time of President Lincoln’s premature death. 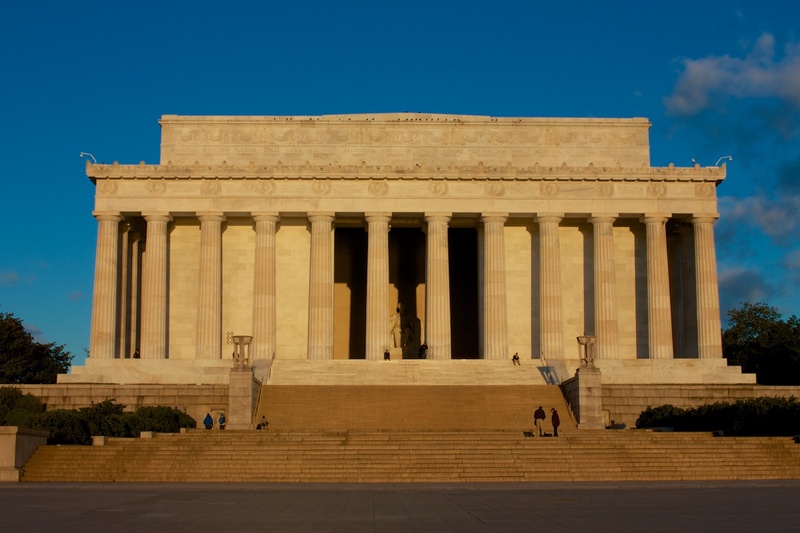 These 36 states are inscribed on the frieze – the area above the colonnade – along with the other 12 states that joined the Union prior to the memorial’s 1922 dedication. 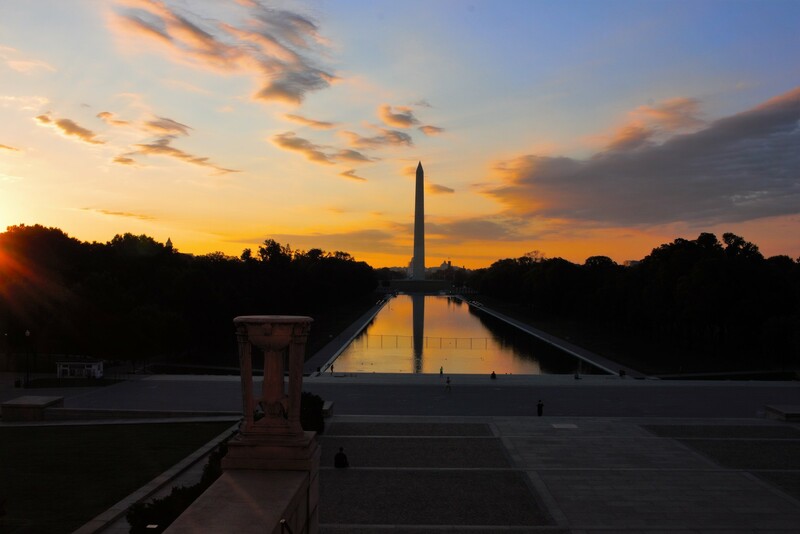 Climbing the 87 steps from the reflecting pool invokes almost as much history as the monument itself. 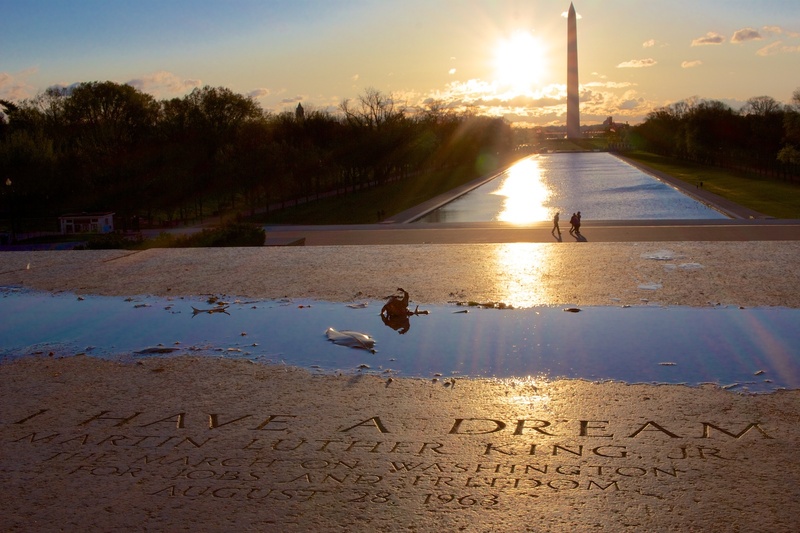 It was on these very steps that Dr. Martin Luther King, Jr. made his famous “I Have A Dream” speech in 1963, memorialized by an inscription on the spot he stood, the landing 18 steps below the memorial. 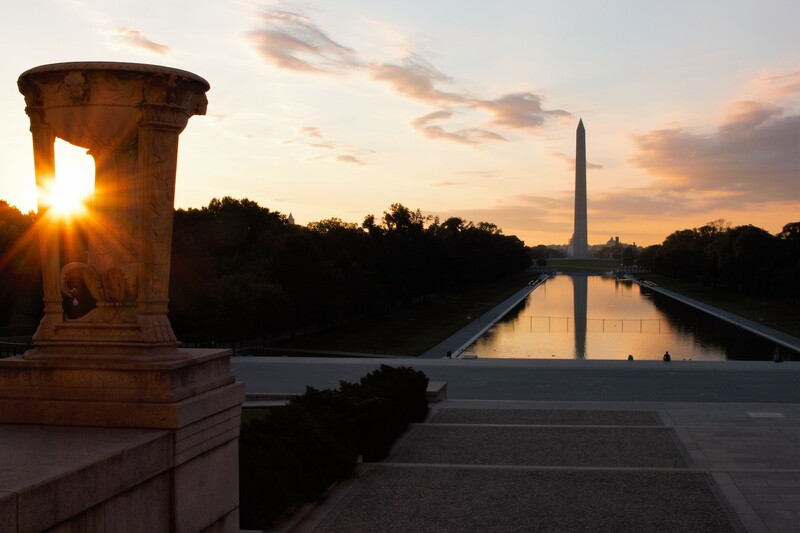 These steps have since been the location for innumerable rallies, protests, meetings, and movie settings. 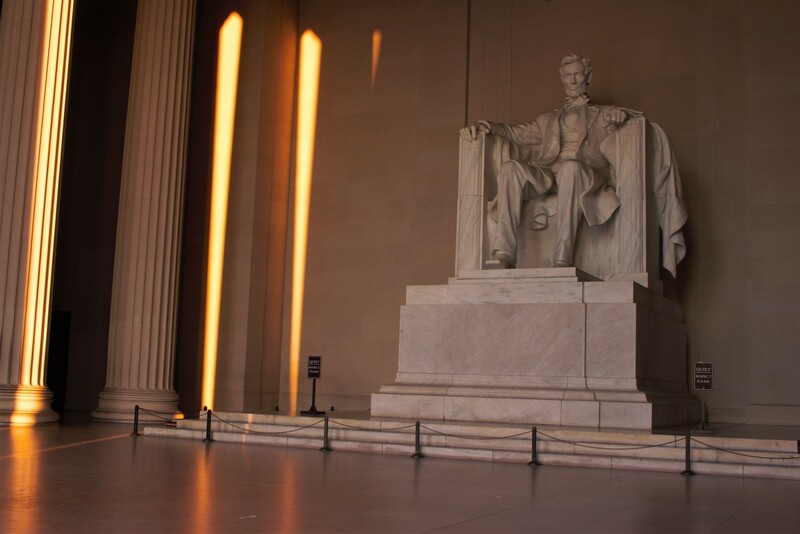 Cresting the stairs brings you face-to-face with Abraham Lincoln…well, face-to-knees is more accurate since President Lincoln in this form is 19 feet tall (he would be 28 feet tall if he stood). This remarkable, 175-ton President Lincoln sits regally upon a marble throne in a state of deep contemplation. 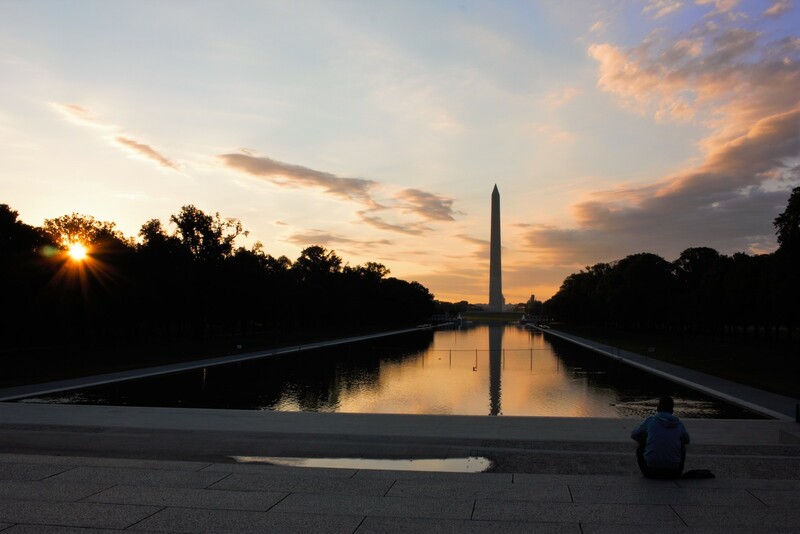 Although carved from 28 separate blocks the figure appears as one, and is brought to life with a probing stare across the reflecting pool. 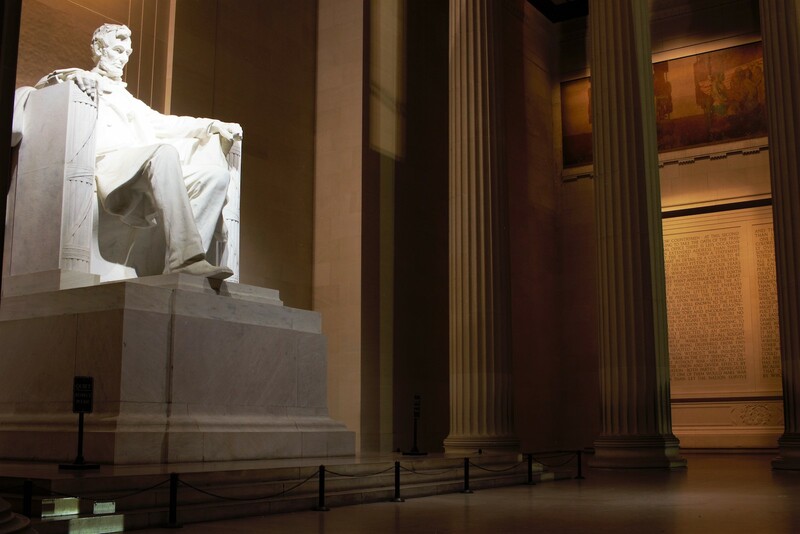 The President looks weary, as if it is the end of a long day of hard decisions. Even his hands betray his troubled thoughts – one pawing at the arm of the chair while the other balls into a fist. 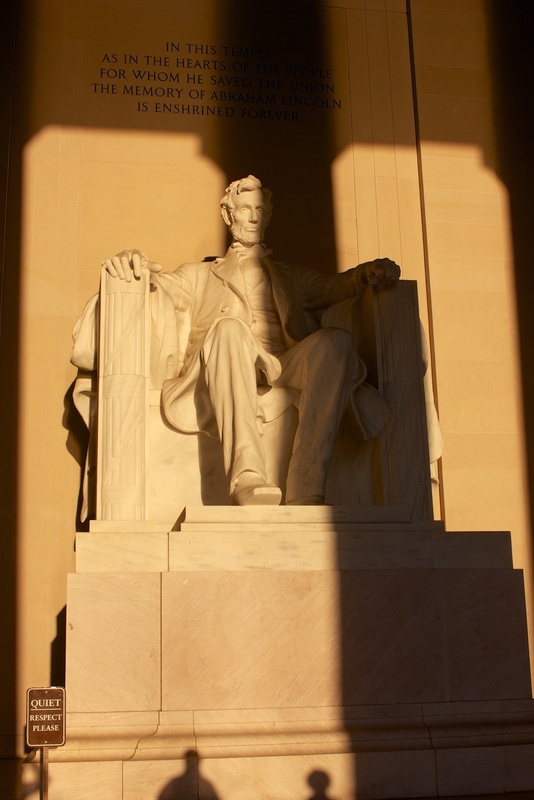 Once you are able to draw your eyes away from Abraham Lincoln’s statue, you will be rewarded with a wonderful interior. Even the ceiling is a masterpiece with bronze girders and panels of mineral oil-saturated marble (to increase translucency). 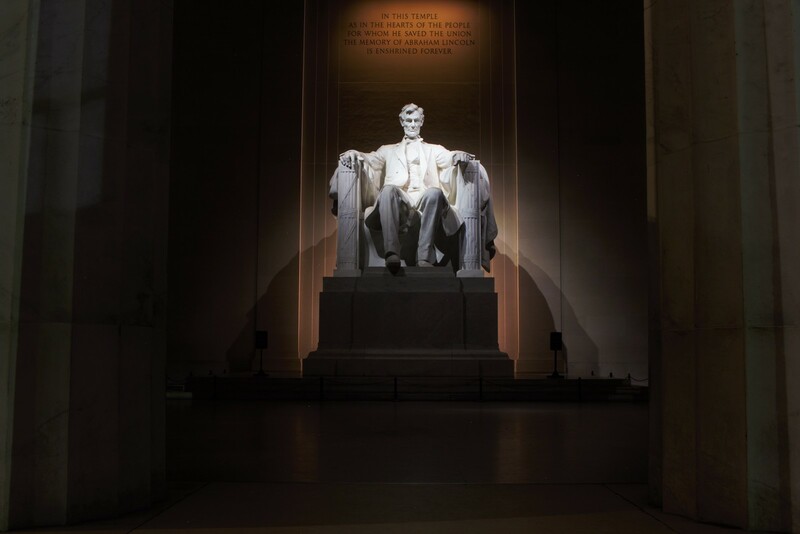 Between the extra illumination allowed by this ingenious system and the floodlights artfully hidden throughout the memorial, Abraham Lincoln is as dramatic in memoriam as he was in life. 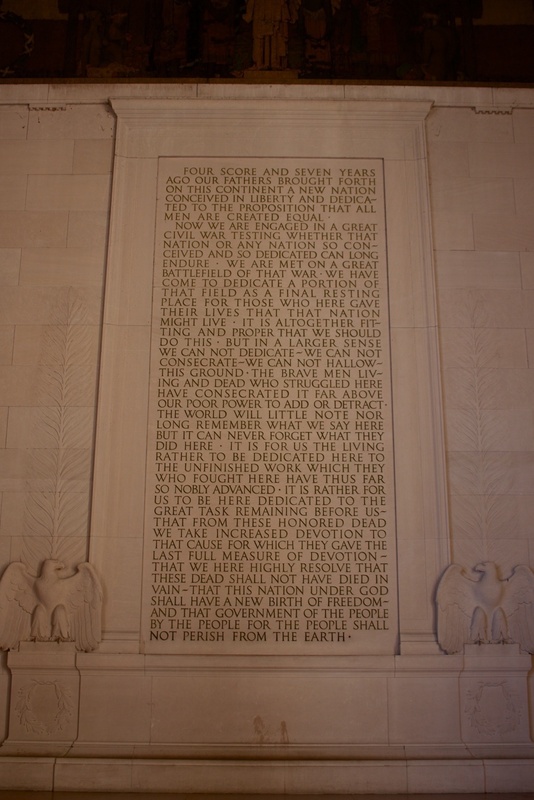 On the wall of either side chamber is a different speech – The Gettysburg Address to the south and the President’s second inaugural speech to the north – topped by stunning murals. 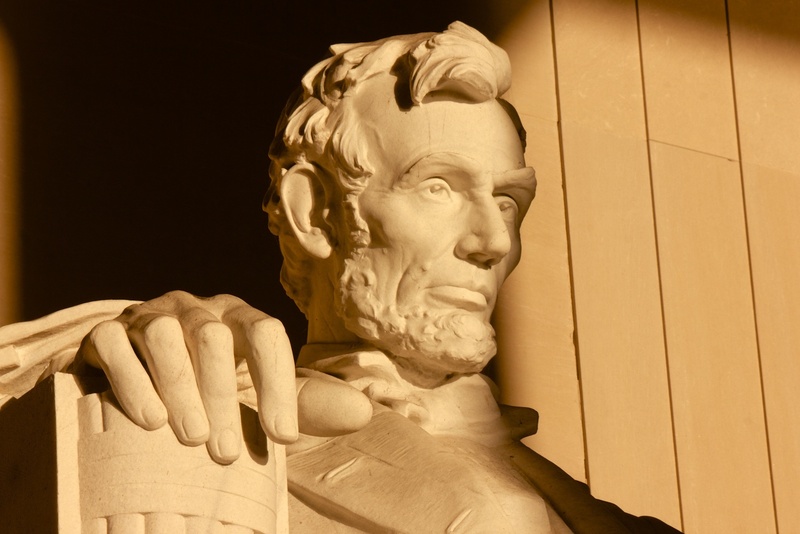 These particular speeches were selected to emphasize President Lincoln’s greatest achievements. 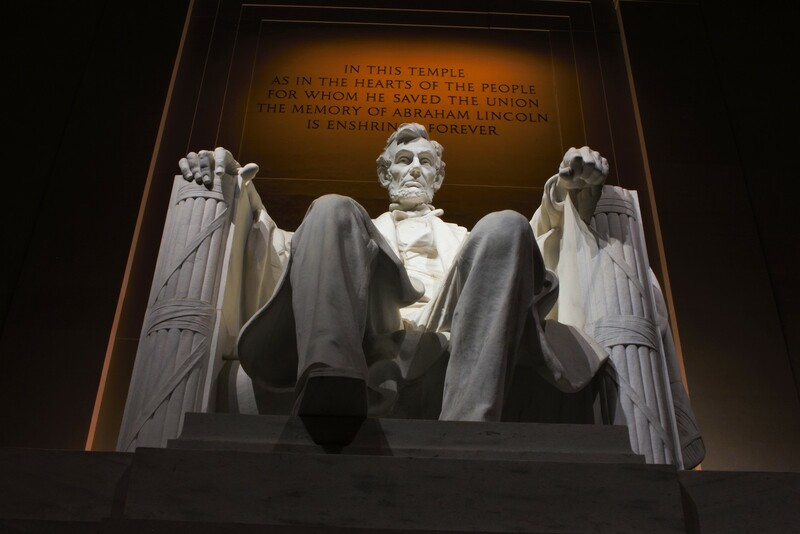 The Gettysburg Address – along with being his most well-known speech – spoke of not just ending the Civil War, but resuming the path set forth by those who created the United States of America four score and seven years prior. 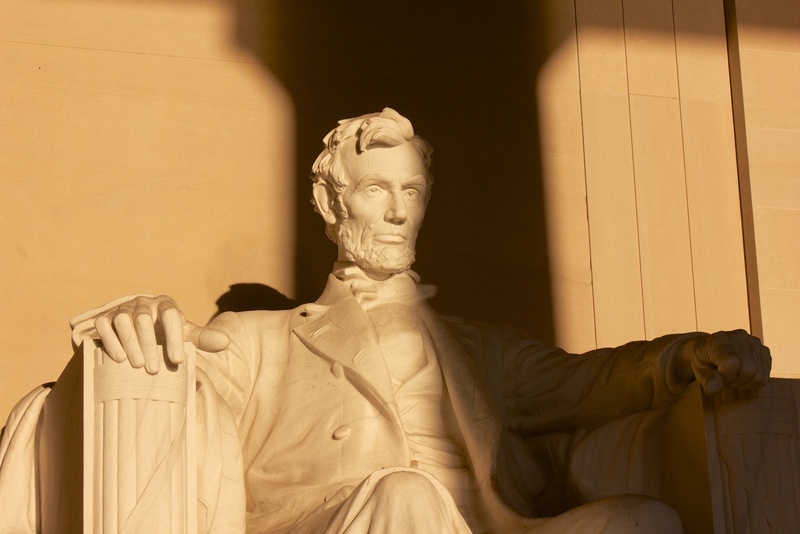 During the President’s second inaugural address, which was given a mere 36 days before the end of the Civil War, Lincoln implored the still-broken nation to rejoin and accept each other “…with malice towards none; charity for all.” These two speeches helped to stitch a wounded America and illuminate a path toward healing. 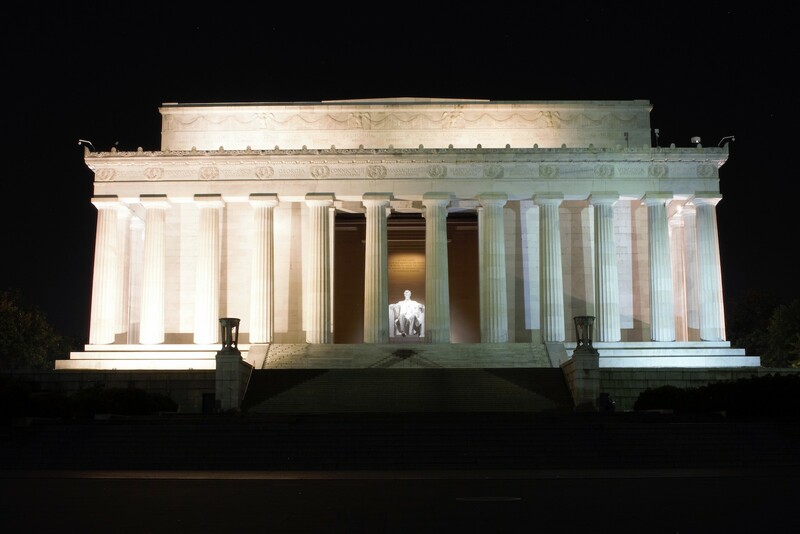 The Lincoln Memorial is an exceptionally popular tourist attraction, but it is something everyone must see and reflect upon. 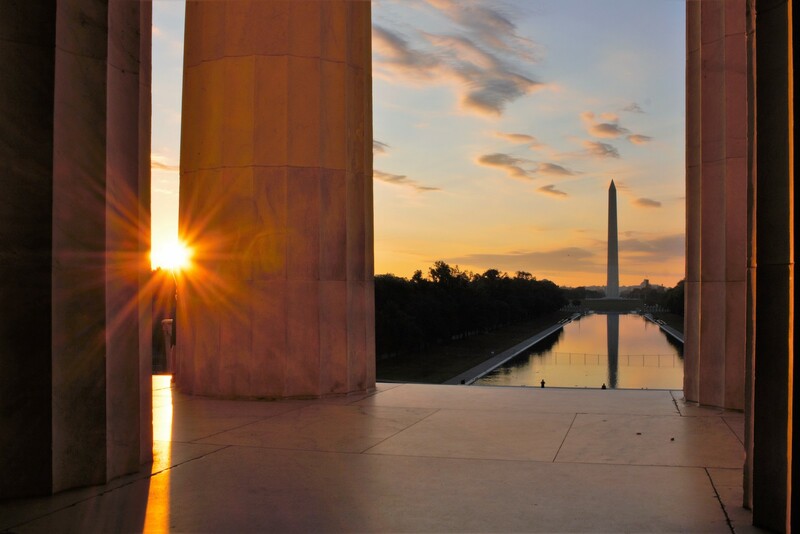 If the soaring Washington Monument is the icon of D.C., the Lincoln Memorial is its soul, radiating inspiration through staggering architectural achievement and memories of what good people are truly capable of.